Hello Willow Bird Challenge #4! Can you say cupcakes? Everyone looooooooves cupcakes! I'm not breaking any news here when I say there's been a mania for cupcakes for a good many years now. There are bake shops who only sell cupcakes and TV shows devoted solely to cupcakes and books strictly about cupcakes. Cupcakes: the cute, sweet, little sister to the cake. The portable cake that was created for you alone. The staple of birthday parties, baby showers and weddings. The darling of the dessert world who can do no wrong. Well, I beg to differ. As far as me and loving cupcakes, not so much. Now, I will admit I've said I love cupcakes on this very blog just a few posts ago. But that was different. That was Carrot Cupcakes and they're like an old friend to me. I could make them in my sleep. But honestly, other than that, I've taken a cupcake walk of shame or two in my career. Cupcakes that are so dry no about of filling or frosting could redeem them from the brink of disaster. Or how 'bout cupcakes that sink in the middle. Or the ones that seem fine and then they won't come out of their cupcake papers! Oh, I know. No one's perfect. We've all had kitchen melt downs. And usually they make us better chefs. But I think I let my cupcake faux pas get in the way of loving cupcakes. And I want to love cupcakes like everyone else. Or at least, understand what all fuss is about. So without further ado I present my entry to Challenge #4. 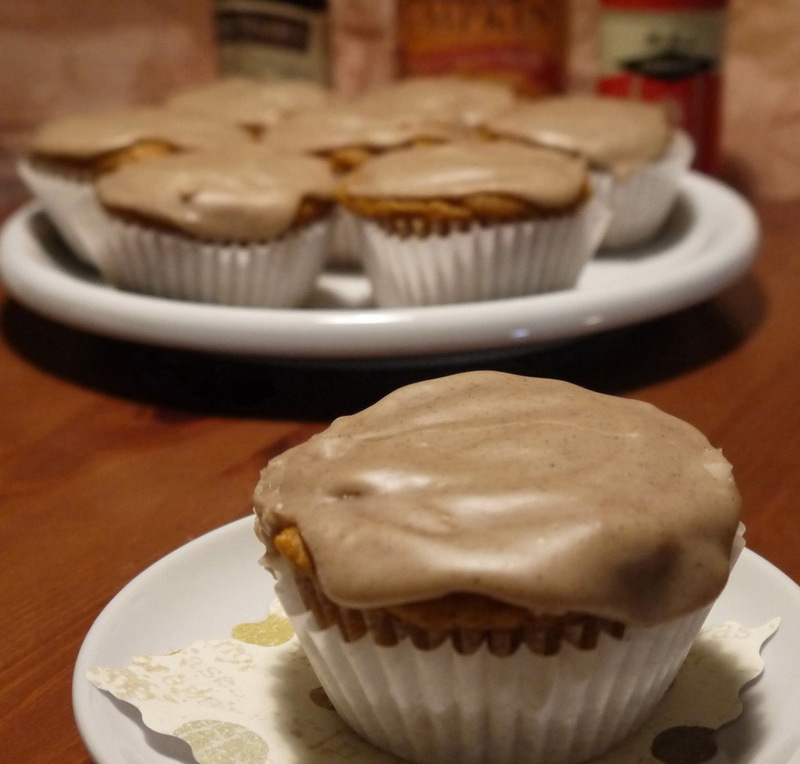 Pumpkin Cupcakes with Cranberry Curd and Brown Butter Glaze. The cupcake and glaze were adapted from this recipe. And the curd was adapted from Nigella Lawson's book How to be a Domestic Goddess. I'm feeling OK about them. They're not dry, thanks to the pumpkin, and they didn't sink, yay! They came away from the papers, another yay. I do love how the flavors play off each other; spicy pumpkin, sweet-tart curd and smoky glaze. Especially love the cranberry curd filling. All in all, I'd say I did a decent job! And got myself one step closer to jumping on the cupcake bandwagon. Just in time for them to go out of fashion. In a small pot bring cranberries and water to a boil, turn down to a simmer and cook for 4-5 minutes until the berries pop and get soft. Strain mixture through a fine mesh sieve, pressing down on the pulp and getting as much juice as you can. Pour mixture into a medium metal bowl; add sugar, yolks and orange rind and stir to combine. Place bowl over a pot of simmering water. Make sure no steam is escaping from between the pot and the bowl. Stir mixture occasionally until it thickens and coats the back of a spoon. Turn off the heat and stir in the butter. If you want a super velvety curd strain again or transfer to a clean bowl, cover directly with plastic wrap and cool in fridge until you're ready to use. Preheat oven to 350 degrees and line a cupcake pan with cupcake papers. In a large bowl combine flour, baking powder, baking soda, pumpkin spice and salt. In a smaller bowl whisk together oil, vanilla, sugar, milk and pumpkin. Whip egg whites, either in a mixer or by hand, to the soft peak stage. Pour liquid mixture into dry mix and stir to combine. Gently fold in egg whites. Scoop mixture into cupcake pans and bake for 20 minutes or until done. Makes 12 cupcakes. In a small, heavy bottom pot melt butter on medium and continue to watch it until it turns light brown in color. (Be careful because it can quickly go from brown to black.) Immediately take it off the heat and stir in the sugar and enough milk to achieve a glaze consistency. Cool the cupcakes and take them out of the cupcake pan. Using a pastry bag with a small round tip fill each cupcake with about 1 & 1/2 tablespoons of cranberry curd. Once filled, top each cupcake with glaze. I've never heard of cranberry curd before much less in a pumpkin cupcake. But when you think about it I guess it's do-able and sounds good! WOW, gorgeous cupcakes! I love all the awesome fall flavors you poured into here - especially the cranberry curd! Thanks! Yes, I am definitely going to revisit that curd recipe again before Thanksgiving!